Branding and design for La Sirena Ristorante's private events deck. After an initial tour, I knew I wanted to capture the look and feel of the spaces. The private events team was specific in their desire to depict the mosaic tiles and gold lighting rings. Using watercolors, I created color swatches and motifs which captured the bright, open atmosphere. La Sirena is a large restaurant located on the second-floor of an even larger building. To help people better understand the layout, I illustrated a street-level exterior view. When looking for a space to host an event, people almost immediately ask for interior photos. Although interior photography provides beautiful visuals, I find that most images don't adequately represent the spaces - they're warped to look larger with a wide-angle lens or creatively cropped. I realized that showing the spaces as they were built would be helpful. I created floor plans to supplement the interior photos, including the essentials: exits and built-in elements such as permanent seating structures. 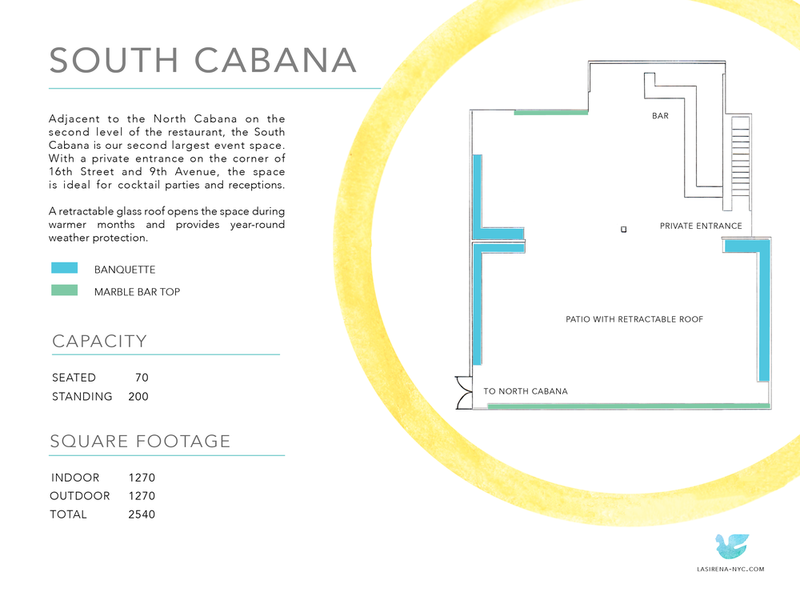 Capacities and square footage help clients see if their furnishings or parties realistically fit in the space. I started by watercoloring swashes of bright colors and various motifs around the restaurant. The lemons and plants were cute, but didn't make sense long-term as they're seasonal. Ultimately, the mosaic tiles and gold rings of light were the most representative of the spaces.